Review: " We love this! There are 10 of each 'critter," more than enough for the chart. We used some of them for flannel board stories and fingerplays. They were also useful for sorting, patterning, and a varitey of number and opersation skills. When we were learning how insect predators and prey camouflage themselves, one child found ways to demonstrate with the "critters" whose strong velcro adheres to stuffed animals and assorted materials. Even the teachers had trouble finding their hiding places!" Give your math lesson wings with our exclusive and adorable critter patterning and classifying chart. Teaching children with classifying, patterning and counting is easy and engaging with the help of 100 plush critters, which attach to the colorful chart with hook-and-loop fasteners. Chart features 10 clear vinyl pouches to store insects when not in use. 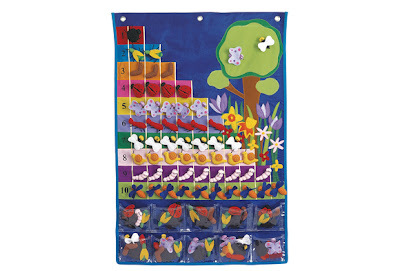 Durable hanging chart measures 24"W x 36"L. 10 each of 10 different insects measure 2-3"L. Surface washable. Save Even More! 20% OFF Selected Items! SAVE 10% on Janti-Craft® Birch Storage! SAVE 15% on items in Language and Social Studies! Arts and Crafts on Any Budget!